What can we say about Dougie that he doesn’t tell us below? …..Well, in between his “real” jobs, he’s also got the huge task of keeping us on air and does a great job of it too! Dougie’s show just wouldn’t be the same without Foxy Roxy on the ‘Lost Lyric’, the sexiest bunch of ‘zeros and ones’ on the radio! Dougie, or “oi’ don’t do that” as he thought he was named for the first fifteen years of his life, was born and bred in Brighton. He was from this moment on expected to ‘grow up’. Unfortunately, as soon as he was old enough to decide what he wanted to do with his life, it became clear that this was not going to happen any time soon as he wrote ‘DJ’ on his careers form. Both Dougie’s careers officer and his father (who incidentally are two different people, as far as we’re aware) agreed that he would have to get a ‘proper job’ at some point. The compromise was a ‘proper job’ in the wireless broadcasting industry where Dougie honed his on air skills and off air production over some thirty (and the rest!) years. I was going to write some extremely funny ‘self deprecating’ stuff here, but as it’s in the ‘third person’ it won’t make much sense and you wouldn’t believe me anyway…..
AKA Doygal, he has also played records alongside Fatboy Slim (or Quentin as his Mum calls him) Alex P and Brandon Block and the bloke out of ‘Massivo’ who had a big hit with their version of Minnie Riperton’s – Lovin’ You in the early 90’s. He’s also played alongside loads of other big names, but humility won’t let him name-drop them all, plus I can’t…..I mean, he can’t remember them all. 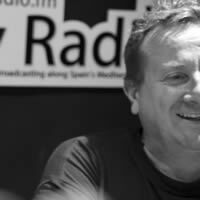 Apart from when he presented the Capital Radio Groups hugely successful ‘Party In The Park’ on a couple of occasions. He worked with that Gary Barlow and a number of others whose names no longer grace the hit parade. Dougie likes house and soul music, peanut butter and Chateau Neuf Du Pape…..oh and ice-cream, he does love his ice-cream.